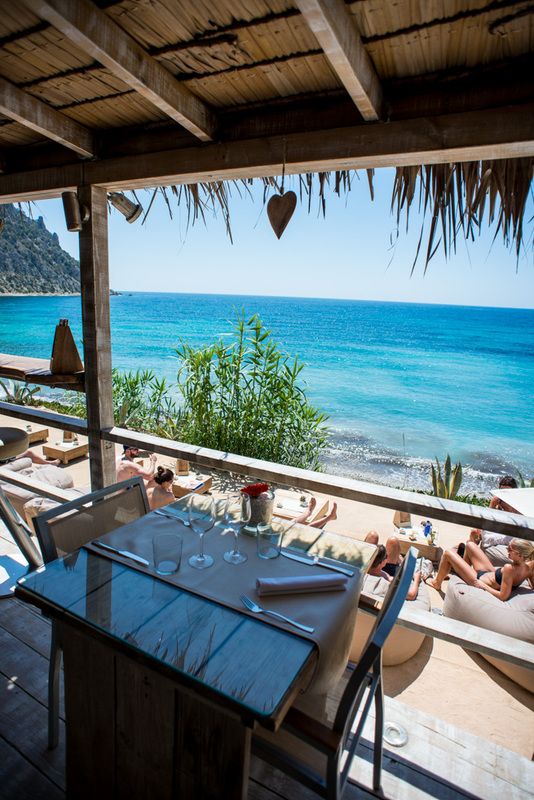 As a former Ibiza resident, it goes without saying that I believe this Balearic Island is the best in the world for beach club restaurants. 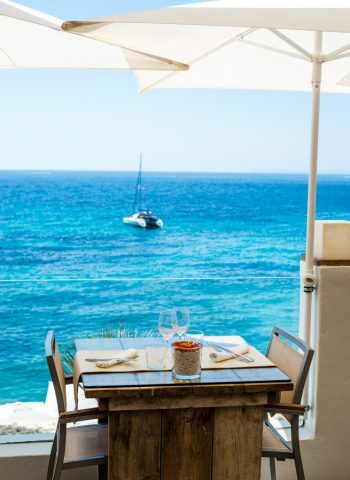 Having perfected the art of combining melodic deep house beats, luxurious chill-out beach bed vibes, and delicious dining, Ibiza does it like no other beach destination. Amante Ibiza, is an institution in this. 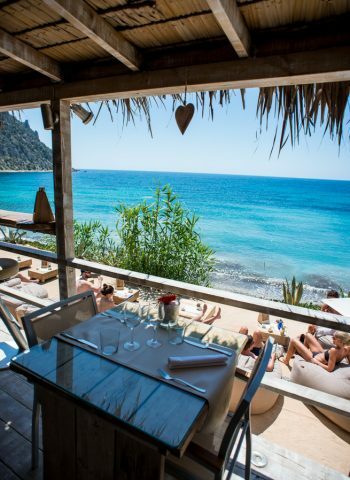 Nestled in-between the striking sandy cliff-tops, luscious green ‘pitiusas’ trees, and pebbled beaches of Cala Llonga (a beautiful small playa on the East side of the Island) Amante Ibiza is a tucked away gem of premium beachside dining. To reach it, you must meander up a winding dusty road right off Cala Longa that takes you through a sea of red poppies and overlooks the beautiful rolling hills of Santa Eularia. 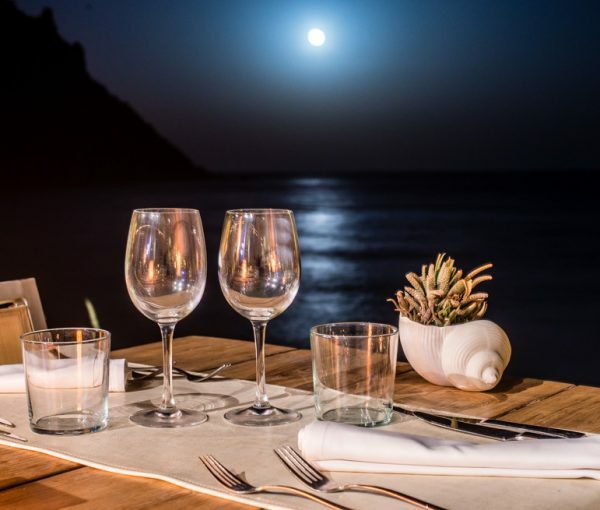 After about 0.7km, you hit a rustic car park on top of a cliff-top overlooking the sea and can follow the wooden beach bar signs to Amante. But it is the food that remains Amante’s speciality. 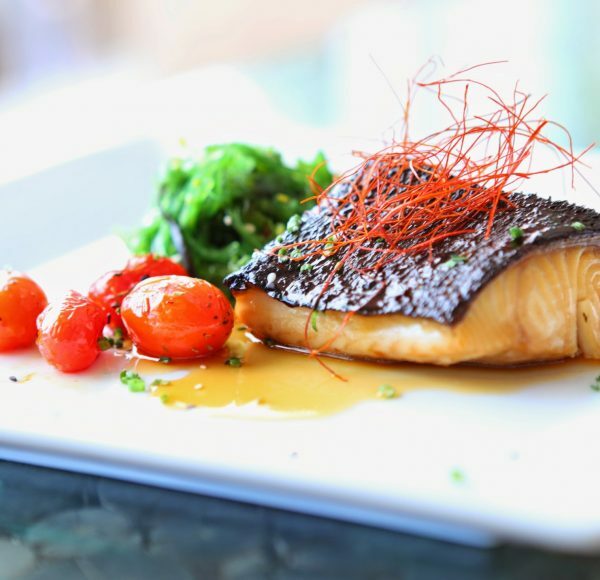 A contemporary blend of Spanish and Italian, and analogous with the venue’s premium feel, the restaurant offers stellar ingredients sourced from its own organic garden. Ibicenco native Guillermo Ferrer tends to it this lovely organic plot situated just 5 minutes away, bringing over 30 years organic farming experience to ensure that Amante delivers the finest fruit and vegetables. 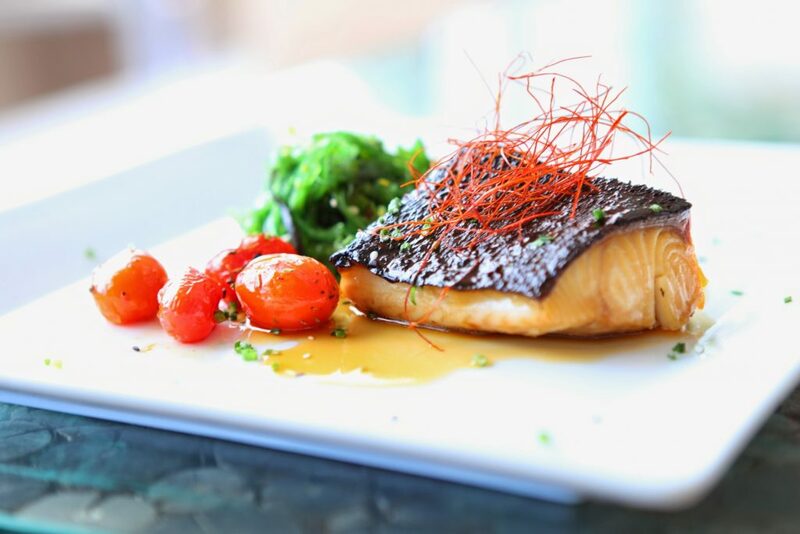 The fresh fish and meat on the menu are of course, similarly local, and prepared in the Josper oven – an Amante speciality for tender and juicy cooking. Dining on a warm Friday afternoon, I enjoyed one of Amante’s cocktails whilst waiting for my guest. The hospitable bar staff recommended the signature Amante Passionate cocktail – a delicious tall drink of gin, passion fruit, strawberry and a touch of chili. 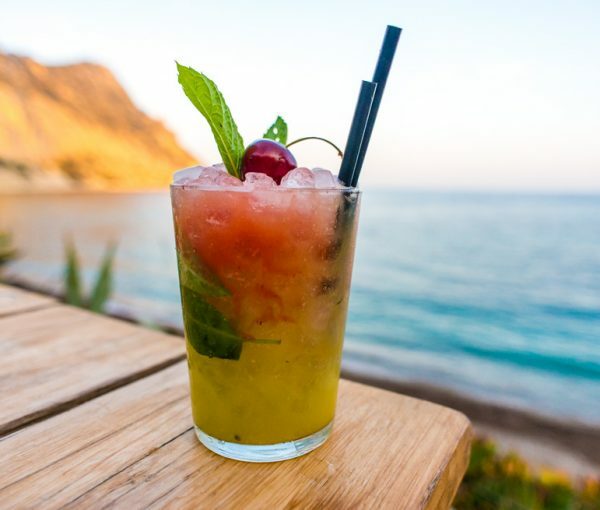 Given Amante is renowned for being a premium beach bar, the cocktails are on par with the premium food and excellent. 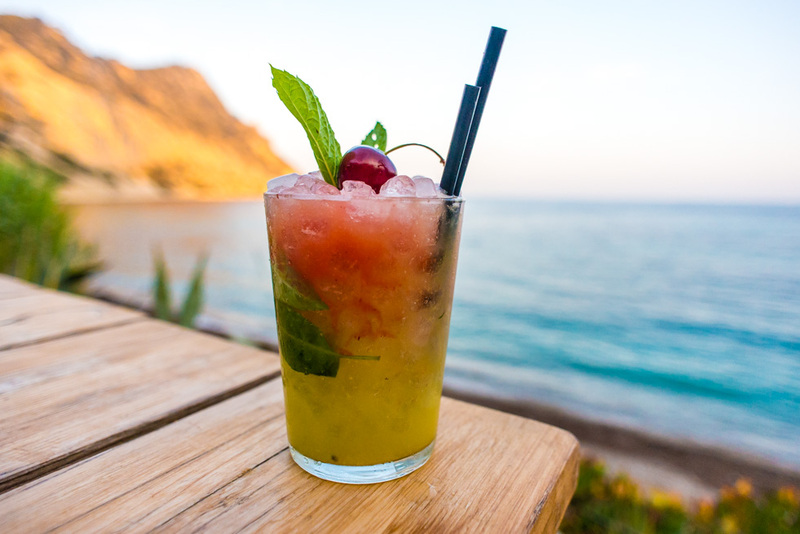 They also offer healthy non alcoholic smoothies and drinks for those looking to detox on their Ibiza stay. The wine list, meanwhile, for those looking for something stronger, is succinct and authentic, focussing on D.O. Spanish specialities and a strong range of well priced cavas, champagnes, and roses (including my favourite Ibicenco rose ‘Ibizkus Monastrell’ – a tempranillo and syrah blend from Ibiza that is well worth trying whilst on the island). Given its spectacular cliff-top location overlooking Sol Den Serra, Amante Ibiza is set across three floors, cascading elegantly down the cliff, enabling it to offer a top floor large restaurant space, a second floor shaded balcony terrace of tables with a bar, and finally, a ‘ground floor’ terrace of seafront beds, lounges, and shoreline tables overlooking the sea. Here, there is, of course, the quintessential Ibicenco vibe of chilled out deep house beats in the background and a deceptively abundant space for lounging in front of the spectacular sea view. As the only beach bar in the cove, there is a deliciously exclusive and intimate feel to Amante that marks it out from the other beach bars. 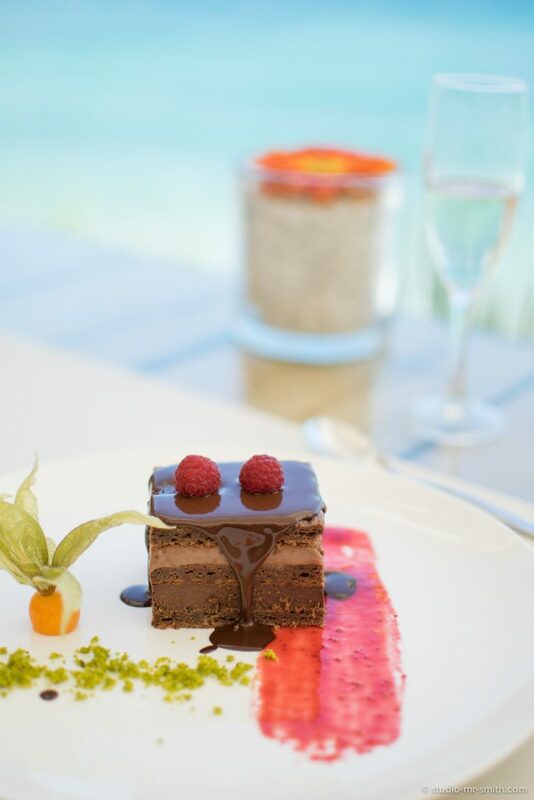 Serving lunch and dinner, Amante is an idyllic destination for tranquil beach side dining, as well as a picturesque setting for weddings and private parties. 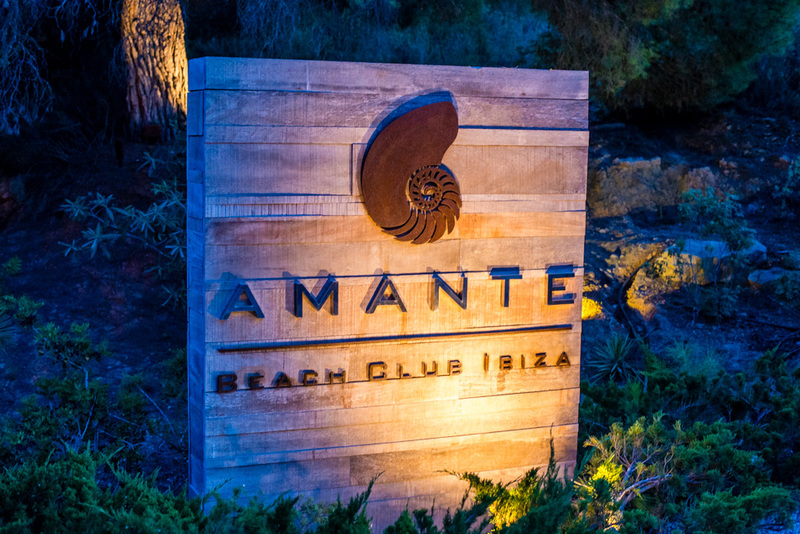 Amante also hosts film evenings, corporate events, and fashion shows throughout the Spring and Summer, rendering it a multifaceted luxurious beach bar setting for any events that you may want to host. The movie nights are a particularly exciting addition to Amante. Arguably the most beautiful cinema in the world, Amante showcases quality films with fresh popcorn and a selection of Jean Leon wines against a backdrop of gentle warm waves, striking cliffs and Ibicenco sunsets. For the mornings, Amante offers a 9am Hatha yoga practice on weekdays throughout the season. Upon my guest’s arrival, and being seated at our seafront table on the beach, we were bestowed with a warm bread basket of Amante’s homemade bread and ‘tomates’ dip – a delicious Spanish traditional sauce of fresh tomatoes, olive oil, and garlic. To start, we were recommended a light and delicious dish of fresh diced, marinated cod in the form of ‘ensalada de tomate ecológico con bacalao confitado y aceitunas Kalamata’ (Organic tomato salad, confit cod and Kalamate olives). We also had the tartar de remolacha, aguacate y nabo encurtido con salsa de aji amarillo v (Beetroot and avocado tartar served with marinated turnip and aji dressing). This was equally fresh and healthy in taste, with a lovely spicy finish from the Peruvian yellow pepper dressing. To pair with this, I had the Excellens Sauvignon Blanc, a D.O. from Rueda, that was light, fruity, and zesty enough to cut through the richness of the fish. My guest had the Jean Leon 3055 Rosado Pinot Noir, a D.O. from Penedes that was of the typical Spanish rose style – fruity, luscious, and very refreshing. For the main, we were advised to try the calamar de Formentera al Josper servido con puré de patatas y sobrasada ibicenca y espárragos de mar (char-grilled Formentera squid from the Josper oven served with soft potatoes, Ibiza’s sobrasada (traditional spiced meat) and salicornia sea weed). Fresh from the Josper oven, the octopus was smokey and deliciously chargrilled, with a pleasant crispiness on the outside yet tender with the bite, whilst the crisped Ibicenco meat was excellent. We also had the cochinillo deshuesado y con piel crujiente, puré de boniato y cebolla roja marinada (slow-cooked boneless suckling pig served with sweet potato and marinated onions). The pig was crispy on the outside yet tender on the inside as it should be, whilst the sweet potato puree added a pleasant earthy and zesty undertone to its richness. Amante’s dessert menu is notorious for repeat visits and the selections showcase why: there is Pan y Chocolate, which looked divine, as a chocolate ganache with crispy baked bread pieces, olive oil foam and flaked sea salt, as well as a an avocado dessert of light avocado mousse served with fresh strawberries and crunchy pistachio crumble. After much deliberating, we followed the staff’s recommendations and tried the cremoso de chocolate con esponjoso de pistacho, roca y sorbete de frambuesa y (cream of chocolate, pistachio sponge, raspberry and raspberry sorbet) and the crema de pomelo, bizcocho de remolacha nueces Pecan y moras (pink grapefruit crème with beetroot sponge, walnut and blackberries). Both desserts were fantastic, and presented creatively in the form of a deconstructed cheesecake style dish with chunks of light, fluffy sponge, decadent cream, and fresh fruit. 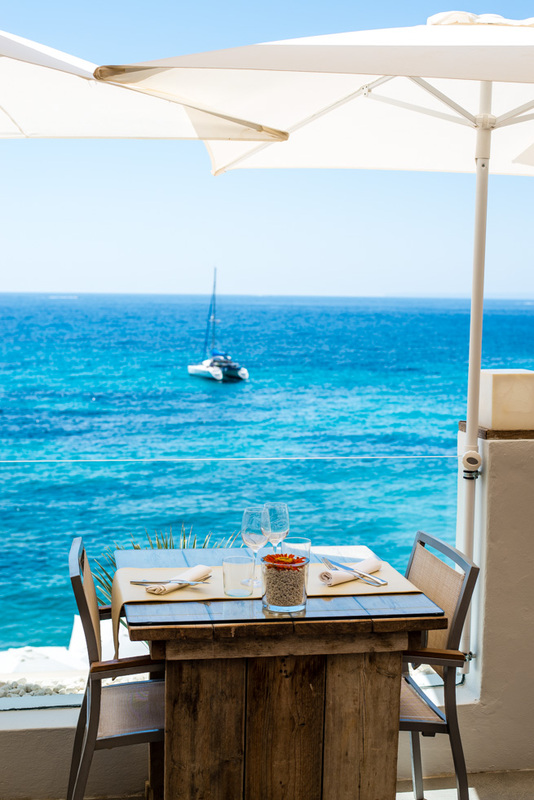 Despite the seafront setting, and relaxed, white washed wooden Ibicenco interiors, Amante’s food is surprisingly on par with fine dining rather than beach chic – yet the vibe remains one of effortless cool. 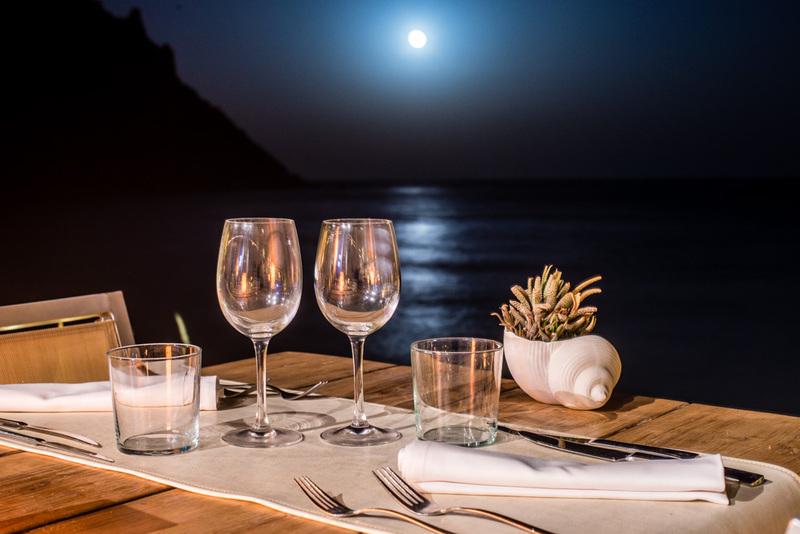 This combination of elegant food, stunning, Ibiza beach scenery, and melodic beats, ensures Amante Ibiza to remain in the upper echelons of the islands seafront dining spots. 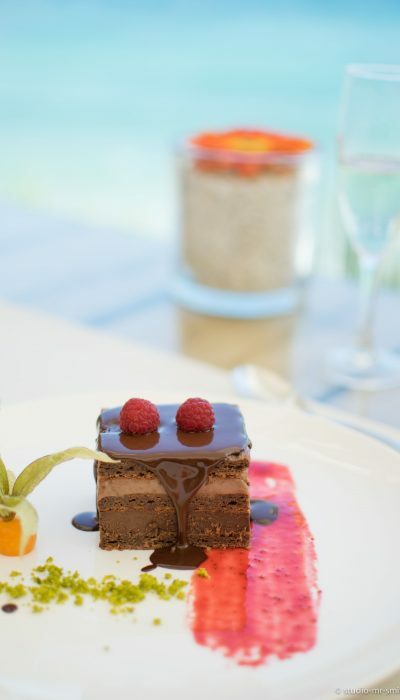 For a perfect afternoon of sunbathing, cocktails, music and luxurious food, it’s hard to beat Amante.